Magicians have long been a staple on the Las Vegas Strip. But what if we told you magic is no longer a solo act? Instead of watching just one illusionist you can gather round for four different tricksters in one eye-popping show. 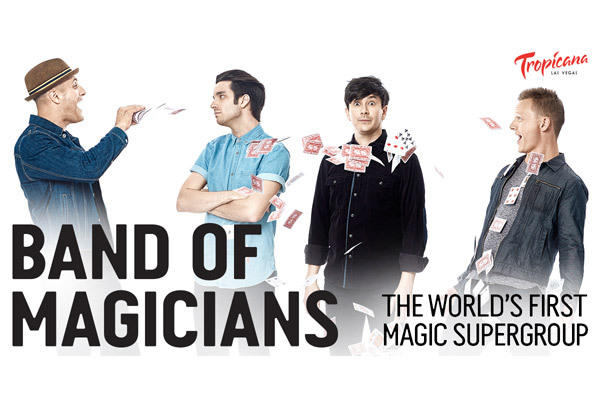 Band of Magicians has brought four of the brightest young magicians from across the globe to the Tropicana in a new show you have to see to believe. The Band consists of James Galea, Australia’s Number one magician; Stuart Macleod, a Scottish BAFTA nominated magician who has racked up over 40 million views on YouTube with his work; Brett Loudermilk, a Los Angeles native who specializes in blurring the lines between what’s real and what isn’t; and Joel Ward, a regular at The World Famous Hollywood Magic Castle. This groundbreaking show is unorthodox. Never has a group of magicians come together to share their illusions on one stage. The concept behind the show is for the magicians to interact and act as their own stage hands. There is constant communication between themselves and audience members. As you can imagine, Band of Magicians is jam-packed with jaw-dropping magic as well as incredible feats of strength, hilarious acts, and a soundtrack that will make you think you are at a concert. Bonus it’s good fun for the entire family. Band of Magicians performs Wednesday through Monday at 7 p.m. at the Tropicana Theater. You can find discounted tickets right here on Best of Vegas.